Despite the wet weather and probably because of it this year has seen our best onion crop. On our Hitchin allotment we planted these red and yellow onion sets last autumn and the rain has made them grow and swell beautifully. Keen not to have a repeat of last year where the onions were left for too long in the soil and rotted we decided we would lift them this weekend and bring them in to dry out. They’re currently laid out in my well ventilated greenhouse where they will remain for a few weeks. 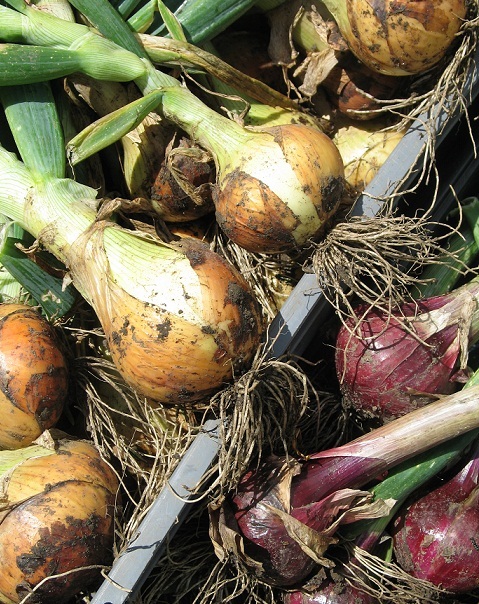 Onions are such an easy vegetable to grow demanding little other than the odd bit of weeding. I love to use red onions in a greek salad at this time of year or make an Alsace tart like the recipe from Waitrose here.